Let me start this up by saying I haven't enjoyed a movie this much in a long time. The machinery of the Hollywood distribution business has fallen into the repetitive practice of hipping up product that sinks itself within five minutes of opening, unable to support the almost god-like audience expectations. And Prometheus is no foreigner to the fabricated Hollywood momentum. To say there has been a lot of anticipation built up around Ridley Scott's latest cinematic dream is an understatement. It seems Hollywood finally got it right. We no longer have to drone ourselves to the theater and laugh off what the ads were claiming would be fantastic and is actually born to mediocrity. We can expect a movie to be as good as it's expected, and in fact, even better. Much much better. I attended the midnight screening late Thursday night and the energy in that place was amazing. This is what story telling is about. The human need for the discovery of an incredible story is well alive. It bonds us all. Gives us a reason to dream and fight for what we want. The illusion is the flame. The screenplay felt flawless. It would have been so easy to make this another fare in Alien combat. Us running around helpless with useless weapons. Them chasing us effortlessly. The pretty girl screaming on the side. I think other filmmakers did that once or twice. Not John Spaihts and Damon Lindelof. These two delved deep into humanity's unanswerable questions. Who are our Gods? Why? Where? And what is to say of the father-sibling complex? Are our parents like Gods to us? Gods of flesh that have guided us to where we are? Or are they simple humans we must be rid of in order to proclaim ourselves as masters of our own insignificant universe? This and much more is all tucked away behind the perfectly stylized curtains of Ridley Scott's science fiction world. The movie feels right down fascinating. Reminiscent of that first Alien film. Those early shots way before the egg was revealed. Even the opening shots inside a dormant Nostromo. Remember those? How haunting? How intriguing? Ridley's hand is still very much present here. At its best shape. I simply couldn't get my eyes off that screen. Fascinating. Even the 3D element played well into it. I thought this might turn into another "let's poke the audience in the eye" kind of trip, but instead it felt like an immersive experience. I almost forgot I was in a movie theatre at times. Dramatically. The acting was phenomenal. Nothing that required exaggerated exuberance. Acting is mostly an art that goes unnoticed because of its sincerity. So real that we don't question it. A simple matter of fact. This film required that kind of delivery. The kind of dramatic honesty that allows the screenplay to unfold itself effortlessly. I will close this by pointing out that I wasn't particularly scared this time around. I recall being horrified the first time the Alien burst out of Kane's chest back in the day. 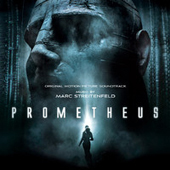 Although, Prometheus doesn't seem to be a product of the horror genre. Suspenseful and though provoking are more along the line of the goals this motion picture attempts to deliver, and does masterfully. *Text presented as published in various sources. All content is copyright registered property of Santiago Manes Moreno and may not be reproduced in any way without permission.